Depth: 55.6 mm. Width: 65.1 mm. Height: 55.6 mm (without snaps). Connector: press stud large-snap connectors. Price: £10.45 each. £9.99 each if you buy two or more. Postage and packing included. 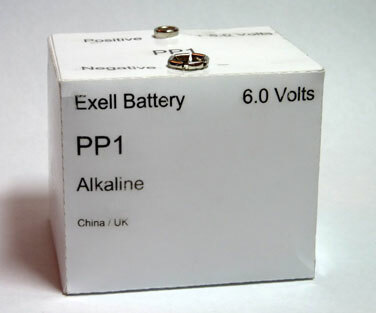 This PP1 battery is used in a wide variety of meters, vintage radios and other devices. Murphy B485 MW/LW 7 transistor radio (1961)....and many others. Several of these vintage radios take two of the PP1 batteries. This PP1 battery uses the original carbon-zinc layer cell technology to deliver a long battery life. This PP1 battery has identical snap connectors to the popular PP9 9V battery. These PP1 batteries have a long shelf life. Why not buy two or more packs, take advantage of our reduced price and make sure you are not left without your vintage radio next time your battery runs out.